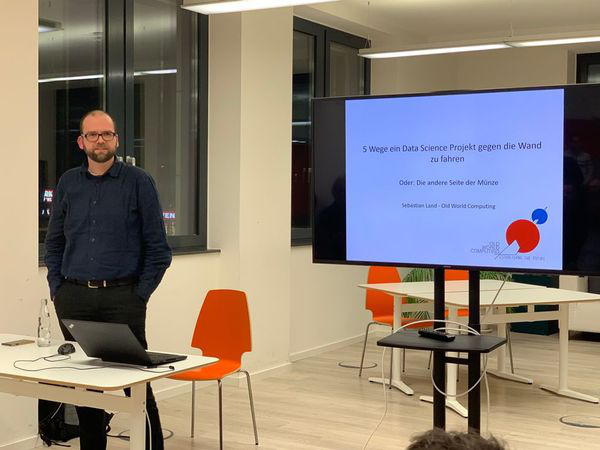 Yesterday, Sebastian held a talk at the Business Intelligence and Analytics meet up at RapidMiner in Dortmund. There, he took a slightly different approach to talking about data science projects: Instead of enthusiastically discussing merits and benefits of establishing data science in a company, he pointed out possible pitfalls along the way. It seems that over recent years, many people – especially managers and supervisors – have forgotten what’s long been known: Mistakes are allowed, even helpful. Indeed, one of the best ways to learn is from your own mistakes. Luckily for you, we have already made some of them so you don’t have to go through it yourself. Click here for the presentation as a .pdf document in German and here for an English version, or read on for a short summary of the five strategies you can adapt if you want your project to fail as quickly and thoroughly as possible. Or, you know, learn from our mistakes and make your project a success with higher probability. Data Science has been on everyone’s lips for a while now, but, as so often with latest trends, everybody likes to talk about it, while no one really knows what it is. It sounds great, all the big players on the market have it, so obviously we need it, too, and as large-scaled as possible, right? Well, maybe take a step back and have a map with you when you enter the jungle. So now you have an ill-fitting infrastructure with a whole hullabaloo of methods, spent your budget on purchases you might not even need, while having to explain to your dissatisfied employees that they will be left alone with the problems they have now as well as with those that might come up later on. What else can go wrong? Often, the capabilities and opportunities that data science and machine learning offer haven’t been fully understood by a company’s employees. The ways of data science differ from their established work processes, creating fear: if the computer can now do all I do and more, doesn’t that mean I have become dispensable? Behind this is a lack of understanding of what machine learning can do and cannot do: If the machine learns something, it does not mean that the engineer is able to construct a better machine. Also, the machine is only able to learn within a static context, so it will not start constructing something entirely new. However, within these contexts it gives better predictions about the most probable future than any human can make. This allows to make much better tactical decisions in repetitive contexts. But still, strategic decisions that will change the context are the domain of humans that can leverage background knowledge and intuition. Understanding this is what we call the predictive mindset, and it is absolutely essential for a successful project. If the employees don’t even know the possibilities, how can they effectively use them to their advantage? How can they tell the data science team what they need? There is a problem inherent to data science projects you don’t find as much in other, more classic projects: you never really know how good your results will be in the end. Even more, you cannot know how good the best solution would be. So before you start, you have to think about what you consider a good solution – but you also have to accept that there is no such thing as a „correct“ solution. Data science projects are exploratory by nature and you will have to make your map while you are walking. Underlying is a chicken-egg-problem: For conducting a project you have to plan it and the necessary infrastructure. But to do so, you need experience. And to gain experience you have to conduct a project. So what are the steps to let your project fail? 5. Have vaguely defined goals. Data science solutions tend to interfere with established processes and work methods. While it can be used as a supportive element, it can also partially or fully automate procedures – who wouldn’t feel obsolete if they had been doing these things until now? If the domain experts start to boycott the project, it will be hard to get it to success due to lacking knowledge. Even worse, if your machine learning works alright: If nobody ever uses its predictions, what is it worth? The only way to success is to include all stakeholders affected by the project. Fears must be openly addressed and eliminated to build support among employees. Therefore, understanding and a common language for data science must be spread all over the company.